Coloring book fans now have a new opportunity to color the local history of the Somerset Hills area of New Jersey while learning about the area’s historic sites and most memorable moments. The Somerset Hills History Coloring Book highlights the history of Somerset Hills, New Jersey. The area is in the northern section of Somerset County including Bedminster, Bernards Township, Bernardsville, Far Hills, and Peapack Gladstone. The book contains 34 images including the area’s famous people, places, and events in the Somerset Hills local history. General George Washington, General Charles Lee, Widow White, King George II, Governor Sir Francis Bernard and Betsy Ross are just a few of the historic figures that will be ready to color in the book. Historic sites include the Brick Academy schoolhouse, the Vanderveer House (home to General Knox), the Boudinout-Ross House, the Kennedy-Martin-Stelle Farmstead and many other local historic sites. Story images also include America’s first military academy, the lost Pluckemin Cantonment, the ghost of Phyllis Parker, and the infamous capture of General Charles Lee at Widow White’s Tavern in Basking Ridge. The retail price of the Somerset Hills History Coloring Book is $9.99. The intent is for every book that’s sold, one will be donated to a local history educational program. 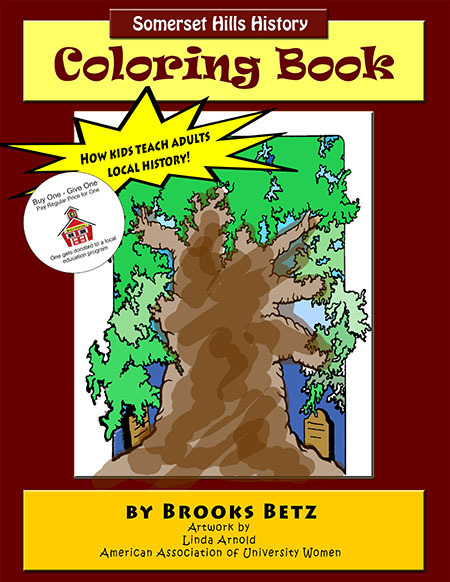 Betz noted,”there’s no intent to make money on the book, I just hope that we can raise enough money to give away hundreds of books so kids can learn about our history and have a little fun”. The plan is to offer the books to the Historical Society of the Somerset Hills education program, housed in a 1809 classical schoolhouse in Basking Ridge. Our donated books will also be shared with local public school programs focusing on the 3rd grade level that studies New Jersey history. A preschool program is also being discussed. Organization will be permitted to copy single pages for individual programs, but if multiple images are needed, it’s suggested that a book be acquired for each pupil. The Somerset Hills History Coloring Book was released on March 8, 2017 and is locally. You can also order online (Click Here) . T3 Consortium will be happy to order books for organizations at cost if they order 25 or more.